Last week we dealt with cruise lines that offer nothing but ultra-luxury but there have always been suites and there has been a growing trend in recent years toward developing exclusive amenities for those that can afford it on all cruise ships. Starting with alternative dining venues, this since expanded to spas and has now grown to see a number of ships featuring exclusive areas just for the well-heeled. Most people do not realize that the first alternative dining venue at sea was introduced over a century ago, when Hamburg America Line included a Ritz-Carlton restaurant in its Amerika of 1905. Later Hamburg America ships also had Ritz-Carlton restaurants. In more recent times, lines such as Holland America Line has added its Pinnacle Grills while Crystal Cruises have from the start offered Asian and Italian alternatives, with Nobu now featuring in both ships. 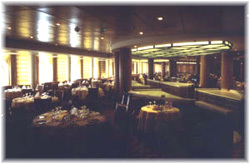 Such venues, along with the grills of Cunard Line, have usually featured in more upmarket ships. A real revolution in alternative dining came about ten years ago, however, when Star Cruises introduced its new Superstar Leo, which operates today Norwegian Spirit. 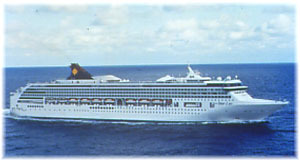 Star bought NCL in 2000 and followed very quickly thereafter by introducing what it styled Freestyle Cruising across the NCL fleet as new ships were delivered from 2001. Charges vary per restaurant, at $10 per person for Asian, $12.50 for Japanese, $15 for French, $20 for steak etc. But one of the complaints about alternative dining venues on the main market lines is that they are extra tariff, or a new form of a la carte. Prices vary, with Azamara and Oceania not charging guests for a certain number of visits, Crystal Cruises charging a $7 gratuity per person and P&O charging $40 per person for long cruises, $50 for 7-night cruises and $60 for 2-night cruises in the Ventura's White Room, supervised by Marco-Pierre White. The most charged by any line is $150 per person to dine in Silversea's specialty restaurant, but this includes a selection of very fine wines in a partnership with Relais et Chateaux. Next came spas. The spa on Seabourn Odyssey, for example, at 11,400 sq ft, will be the largest on any luxury ship but that will be outdone by Carnival Splendor's 40,000 sq ft, which will also outdo Celebrity's 25,000 sq ft AquaSpa on its Summit class, which itself had been expanded from 10,088 sq ft in the Century class. MSC's new MSC Fantasia will feature a 21,500 sq ft Area Spa, dubbed a "temple for wellness." Of course all these areas are great sources of additional on board revenue for the cruise lines and their spa concessions, with treatments easily running into the hundreds, or even thousands of dollars per person, and the sale of beauty potions adding even more opportunity at $180 for a jar of beauty cream on one line. Steiner of London is the largest provider of shipboard spas, having started with Royal Mail Lines' Andes and Cunard Line in 1956. Today it supplies Azamara, Carnival, Celebrity, Crystal, Holland America, P&O, Princess, Royal Caribbean and Seabourn. In 2002, it acquired Mandara Spas, which serves NCL and Silversea. Steiner also manufactures its own health and beauty products under the Elemis name. Other spa suppliers include Samsara on Costa and Carita on Regent. The ultimate development in spas at sea will come with Celebrity Cruises' new Solstice class ships, which will feature a separate Aqua Class. Almost a full deck of 130 staterooms on the Penthouse Deck will give unlimited access to the AquaSpa relaxation room and assigned seating in the exclusive Blu restaurant. Celebrity has always been big on spas and this will be the first time a cruise line has actually established a separate class of passenger based on the on board spa. At Holland America Line, things have taken a rather different twist. With its Eurodam, it has come across the rather unusual idea of installing eight tents on the starboard side of the public pool and fourteen more on the deck above. These cabanas rent for $50 a day ($30 a day in port), with those on the top deck going for $75 and $45 a day respectively, in return for which one obtains wicker chairs, ottomans and an upholstered settee as well as bathrobes, towels, coolers and iPods loaded with music. Luxury at an extra cost, but one wonders, when bathrobes and outdoor furniture are available in all verandah cabins, is this real luxury. Or is ot for those who don't book verandah cabins or even for those who like to be seen as being able to afford things? Only Cunard feature a Grill Class, with its newest ship, the Queen Victoria providing a private area on top of the ship for the Queen's Grill and Princess Grill, as well as an open air courtyard for the exclusive use of Grill Class passengers. 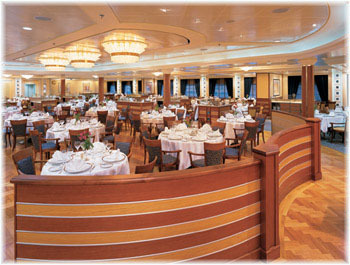 These Grills feature single seating dining and stunning floor-to-ceiling sea views on both sides of the ship. Grill Class passengers also benefit from their own private lounge and a whole list of other amenities, including butler and concierge services in Queen's Grill suites and concierge service in Princess Grill. 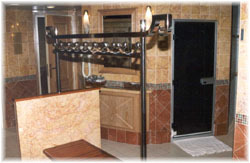 These Grill Class amenities of course mirror the same facilities that are available on the Queen Mary 2 and saw their origins in Queen Elizabeth 2. Essentially, Cunard ships have three classes, of which the two Grill classes provide a luxury experience, with the new ships accommodating those in the best suites in Queen's Grill and those in the deluxe and junior suites in Princess Grill, much as in the QE2. On Queen Mary 2, Grill Class passengers have their own private deck area with whirlpool on Deck 11. MSC Italian Cruises will introduce its own new concept in December with the delivery of their MSC Fantasia. This will be its MSC Yacht Club, an exclusive area on the top of the ship reserved for passengers in the suites. This concept was actually started by Festival Cruises, who introduced a Grill restaurant with special amenities in its first newbuilding, the Mistral, in 1999. Yacht Club passengers in the MSC Fantasia will be accommodated in 99 suites and will enjoy their own forward-facing lounge taking up the whole width of the ship above the bridge (where Carnival typically install their gyms and Princess are prone to place cafeterias! ), thus giving these guests the best views afloat. In addition, they will benefit from their own pool and solarium, direct reserved access to the spa pool, private lifts and reception with concierge service and a private restaurant with a dedicated chef, and of course butler service, not that all modern passengers know how to take advantage of this service. In a different direction, Norwegian Cruise Line's new ships include suites and villas. As these have not always been noticed by the travelling public, or even some travel agents, NCL has published a separate brochure extolling the virtues of its Garden Villas and Courtyard Villas. In addition to the variety offered by NCL with its signature Freestyle Cruising product, the newest ships feature villas that can be used by groups or families. The Garden Villa for example offers up to 5,750 sq ft of luxury � private terrace and sundeck with whirlpool, access to an exclusive courtyard area, living room with baby grand piano, three bedrooms with large closets and three bathrooms � and space to entertain up to 100 people! The Courtyard Villa offers a large suite of up to 572 sq ft with master bedroom and guest bedroom while the Owner's Suite provides up to 1,195 sq ft of living space with master and guest bedrooms again. All of these villas and suites include access to the exclusive Courtyard area of the newest ships. NCL also offers Penthouse accommodations of up to 676 sq ft, again with two bedrooms on all ships. The Garden Villas and Courtyard Villas are available on Norwegian Gem, Jade, Jewel and Pearl, while Owner's Suites are also available on all ships, but only with Courtyard access on these four. Yet another new trend, and perhaps an omen of the end of the days of all-inclusive cruising,NCL is including exclusive extra-cost bars and deck areas in the design for its new F3 ships. The rather hilariously-named Uber Bar is reserved for guests who have booked certain more expensive accommodations but the less well financially off will still be able to buy their way in for a cover charge. Apparently the same will apply at the POSH Beach Club, where passengers travelling in the lower classes will be able to purchase day passes. This venue will apparently also include cabanas, but not all the charges have been released yet by NCL. This is intriguing, as in Apollo Management, NCL is now half-owned by the same people that own Caesar's Palace in Las Vegas. But whether this is really luxury or just young adult trendy won't be clear until the ships enter service. While the larger cruise lines try to cash in on the luxury sector with gated areas, exclusive access and the re-introduction of classes to sea travel, the larger lines are bound to profit from these attempts to pitch their ships a little more upmarket, especially as ships get bigger. Meanwhile, things seem to be going well for some operators but not all in the smaller ultra-luxury market. While Regent talk about one or two new ships, Silversea have just re-appointed V.Ships of Monaco to manage its fleet after the departure of their own senior vp of ship operations and vp hotel operations. With half its passengers coming from the economically troubled United States, fuel prices soaring and new ships abuilding, Silversea is doing all it can to cut costs. At the same time, V.Ships is losing Oceania, which is bringing its own ship management in house. Nevertheless, orders for new ships, not only for the large operators but also for the ultra-luxury sector, are at an all-time high. Seabourn is building three 450-passenger ships, Silversea possibly two 540-berth vessels, Oceania three 1,260-berth mid-market ships that aspire to luxury and sister line Regent possibly two more 800-guest ultra-luxury vessels. By the time these ships enter service in 2009/2012 the economy will hopefully have recovered.